Cerda, a city of just over 5 thousand inhabitants, 60 kilometers from Palermo, is located on the Madonie, not far from the sea, between the Torto and Imera rivers, reached by a winding road that was the site of the glorious Targa Florio. Cerda is the capital of the artichoke, in fact the city celebrate the artichoke festival, in April, and erected a moment in the main square as well. The annual production is estimated at 50 million pieces year, but the primacy of the Cerda artichoke is not due to quantity, but rather to quality. The artichoke produced in Cerda is in fact particularly mild and meaty. There are several restaurants and trattorias in the area that offer artichoke tastings in a thousand ways. One of the oldest buildings in the city overlooks the main square of Cerda, perhaps even the most ancient, made of calcanite, recently restored. Here is a pizzeria restaurant, “Il Marchese”, where Chef Gaetano Varco (in the photo below left, together with Aldo Palmeri, president of the Club Corone Oro Sicilia) cooks artichokes and local meat enriching the dishes with fresh raw materials and only according to availability, making each recipe unique and exquisite. 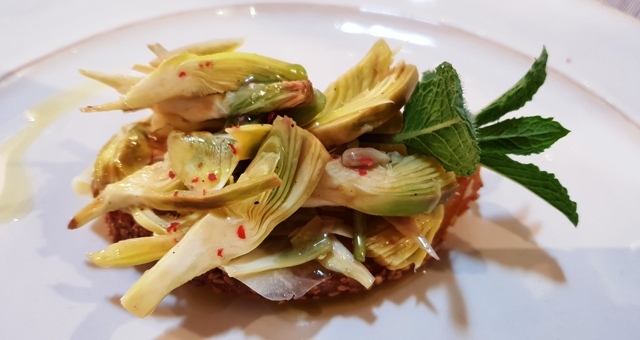 Sicilian wines and special desserts complete the gastronomic experience, however focused on an undisputed protagonist, his majesty the artichoke.